Trita Parsi, the head of the National Iranian American Council and chief apologist for the Iran regime, has long maintained that the bluster of Iranian lawmakers and other officials in denouncing a proposed nuclear deal was evidence of a schism within Iran between moderates and hardliners and that only agreement on a deal could empower moderate elements to win out. The NIAC has even gone so far as to claim that heinous and brutal human rights violations are the product of these ideological struggle amongst Iran’s ruling mullahs. It has been a straw man for the Iran lobby and an effort to divert attention from the truth which is in fact while there are divisions within Iran’s ruling class on how to share power, but both divisions stands firmly united behind a single goal; the preservation and expansion of their power and corrupted extremist Islamic ideology. With little more than a week remaining before a self-imposed June 30 deadline for a nuclear agreement between Iran and the P5+1 group of nations, Iran’s mullahs have expressed little to no interest in completing a deal. This Sunday, Iran’s parliament voted to oppose inspections of government military sites as part of any agreement, in direct opposition to what negotiators from the U.S. and France have called a “must-have” condition for any agreement. 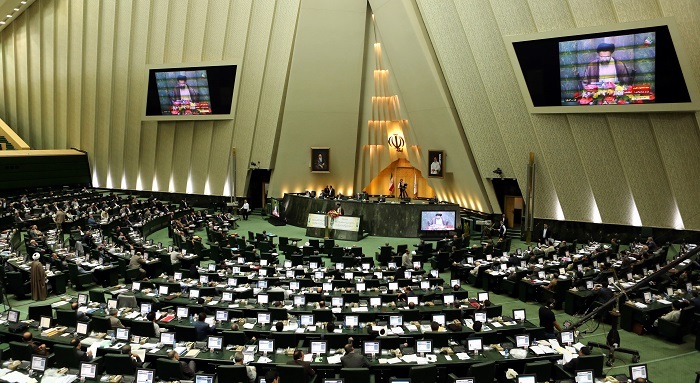 The legislative move follows similar statements made by the regime’s top mullah, Ali Khamenei, who also declared Iranian regime’s military sites off-limits to inspectors. All of this follows a series of concessions already granted by the P5+1 including the exclusion of ballistic missile technology, the retaining of thousands of enriching centrifuges and moves to accommodate Hezbollah and Pakistani nuclear component exporters. Not to mention the failure of the Iran regime to curb its support for three proxy wars, the release of four American hostages and any loosening of brutal human rights repression. This is while over 1800 people have been executed in Iran during Rouhani’s tenure. As the Washington Examiner pointed out this weekend, even though the Obama administration is intently focused on securing a nuclear deal with the Iran regime, it has all but ignored the terrorism that Iran sponsors and facilitates throughout the region as outlined in the State Department’s annual report on terrorism released on Friday. And this strikes to the heart of the argument made by Parsi and other regime allies. If there is a battle of moderate and hardline influences within Iran, where is the proof of moderation on the battlefield so to speak? Nowhere has the regime exercised any restraint or moderation as it pursues its extremist policies. Has Iran regime cut off aid to Hezbollah and Assad in Syria? No, it’s committed another 15,000 troops, this time, including drawing mercenary recruits from Afghanistan. Have mullahs released American prisoners as a show of good faith? No, it is moving ahead with a closed trial of Jason Rezaian, a Washington Post reporter on espionage charges for reporting. Has Iranian regime sought to reassure the world it will comply with nuclear inspection? No, it still refuses to answer questions from the International Atomic Energy Agency in 12 areas of concern over the military dimensions of its nuclear program. It does not take a leap of logic to see that the Iran regime is firmly committed to its course of nuclear weapons development and is merely taking the world along for a joy ride as its seeks its real prize; the release of $140 billion in frozen cash and opening the floodgates of billions more in foreign investment. Parsi and his cohorts can’t even hide this truth with their obfuscations.